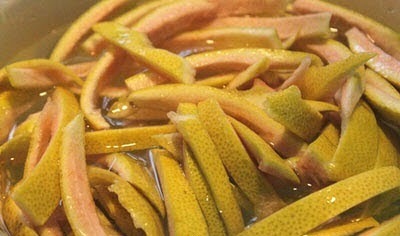 We usually do not use pomelo skin. However, this skin contains many vitamins which are necessary for your health and skin. 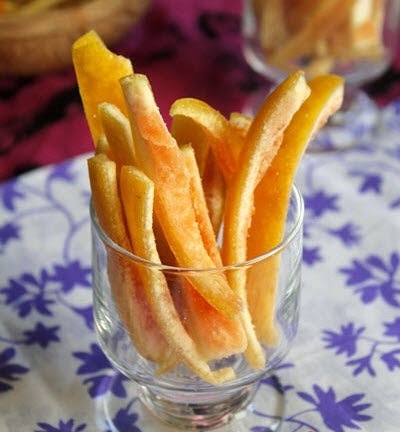 It not only uses to wash your hair (cooking pomelo skin with water and bring to wash can help your hair thick and smooth), but also can create a stunning jam for Tet holiday. 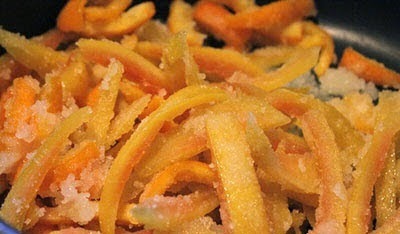 It is called Pomelo Skin Jam (Mứt Vỏ Bưởi), which comes from many spectacular Vietnamese Food Recipes. I bet you cannot stop when eating. This dessert also has another benefit. That is can help reduce the cough when you get sick. So, are you ready to make one of amazing Vietnamese Food Recipes with us right now? If you do want to cook, please follow our instructions below and let us start cooking right now. Step 1: Clean carefully pomelo skin (only use the green part, remove the white part). Slice into long pieces. 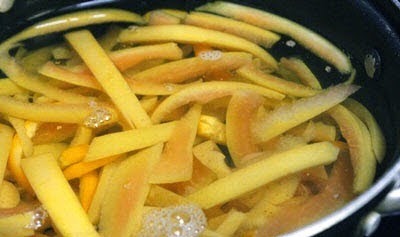 Step 2: Soak them into water added 3 - 4 tablespoons salt in 4 – 5 hours. Then, wash again in 3 – 4 times. Step 3: Cook water until it boils. Then, add alum ball into and cook until it is melted. 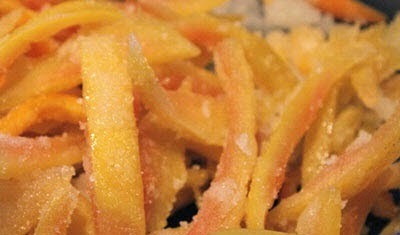 Next, you add more sliced pomelo skin and cook about 10 minutes. Then, pour into basket and wait to dry. Here is the important step to create one of stunning Vietnamese Food Recipes. You should taste now. If it is bitter, you boil more water added 1 tablespoon salt and soak sliced pomelo skin in 10 minutes. Next, wash again in cold water until its flavor has a little spicy is ok. Wait to dry. Step 4: Use your hand to press out water from sliced pomelo skin. 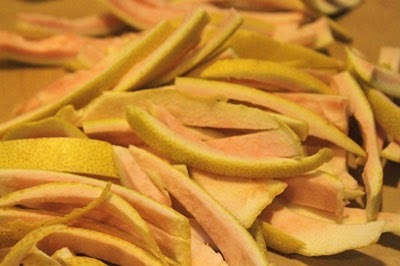 700gr pomelo skin are used with 400gr white sugar. Mix them well and wait in 5 – 6 hours. Step 5: Add pomelo into pot, bring to cook in small heat. Sometime, use chopsticks to stir well until all sugar is melted. Turn off the heat. Finally, your dessert is basically finished. Spread on grid and wait to get cold in 1 day. Next, you can store in glass jar and use day by day. Here is also one of favorite desserts from my mom. When she gets sick, she usually eats a little this jam and she told me it makes she feels better. Hope you love this dish and do not miss our other amazing Vietnamese Food Recipes next time. Good Luck for your Cooking and Happy Lunar New Year.